A while back we reviewed the very first figure in Evolution Toy’s Hero Action Figure (HAF) line. HAF Redman was unfortunately a mixed bag of QC issues. In the time since that figure’s release, the first and now second volume’s of the amazing REDMAN comic from Phase 6 and Night Shining. Series writer & artist Matthew Frank has crafted and truly compelling reinvention of the Redman story and breathed new life into an otherwise obscure cult character. Thanks to Matt we also got our hands on the subject of today’s gallery. Today we’re looking at the incredibly limited Tokyo Comic Con exclusive REDMAN Volume 2 Dark Channel Edition! Not only does this version of volume 2 feature an exclusive limited cover differing from the retail version, but the Dark Channel also came packed with the the even more limited (just 300 pieces!) HAF Redman Dark Version! Thankfully, Matt was kind enough to pick up a Dark Channel Edition for us while he was set up at the Tokyo con, and was also generous enough to sign inside my personal copy of Japanese volume 2. Redman Dark himself is a familiar figure if you’ve handled the original, but there’s something to be said for a sleek black color scheme and some truly incredible glow-in-the-dark eyes. Check out our full 40 image gallery and review after the jump by clicking “Discuss on the TokuNation Forums” at the bottom of this post. We’ll be back in a couple days with a gallery of S.H. Figuarts Shinkocchou Seihou Kamen Rider W Heat/Metal! 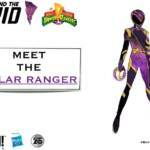 The next saga in the Power Rangers comic series by Boom! Studios was announced at today’s ToyFair reveal panel! 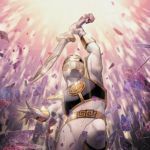 Upon issue #40 of the current Mighty Morphin Power Rangers run, we will begin a new story with the White Ranger making his first appearance as the leader of the Boom! Power Rangers. 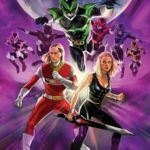 This arc, known as NECESSARY EVIL deals with the fallout of the Shattered Grid events. The creative team on the Necessary Evil story will consist of writer Ryan Parrot and artist Daniele DiNiculo– both veterans of Boom! 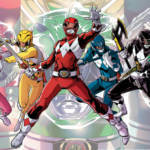 Power Rangers comics. Necessary Evil will officially begin in June 2019! Stay tuned to TokuNation for all Boom! Comics detals. Artist & writer Matt Frank just dropped us a line to let us know that after several years in limbo, the second half of his & writer Chris Mowry’s critically acclaimed series Godzilla Rulers of Earth, is finally being collected in paperback form! IDW released Rulers in single issues from 2013-2015 completing a full 25 issue run, making it the longest running Godzilla ongoing comic ever, eclipsing the original Marvel run by 1 issue. Originally collected in 6 smaller trade paperbacks, the Complete Rulers of Earth Volume 1 came out in 2016, though it’s now out of print. 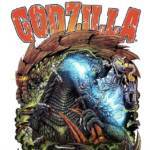 3 years on IDW has finally announced the Godzilla: Complete Rulers of Earth Volume 2! This volume will collect the second half of the series, issues 14-25. As of now the scheduled release date for Godzilla: Complete Rulers of Earth Volume 2 is August 13, 2019 and retails for $29.99. We encourage you to head to your Local Comic Shop and make sure you get in an order for it before the FOC (Final Order Cutoff) through Diamond Comics which is at currently mistakenly listed as 12/31/2039. We just recommend you begin talking to your local shop in the near future if you want to grab a copy of this book. Volume 1 has been out of print for some time and fetches a decent amount on the secondary market. If you’re unsure as to the local shops in your area, you can use the Comic Shop Locator Service to find one now! Many fans of Power Rangers will agree that possibly the lone shining light during the franchise’s 25th anniversary was the success and enjoyment of the Mighty Morphin Power Rangers and Go Go Power Rangers comic book series by BOOM! Studios. It would appear that the more mainstream media now agrees as the Go Go Power Rangers comic, written by Ryan Parrott and illustrated (for the majority of 2018) by Dan Mora is up for IGN’s Best Comic of 2018 Award. The competition Go Go Power Rangers faces is pretty stiff however so it will need every Power Rangers fans’ help in getting itself across the finish line. What an opportunity to show the comic book world that the Power Rangers are more than just a licensed TV show comic but instead are an in-depth look at the lore and the universe that makes up our beloved franchise. To check out the full list, descriptions, and to vote – click here. Good luck Power Rangers! Regardless of the outcome, you’re one of our favorite comic books of 2018 and beyond! 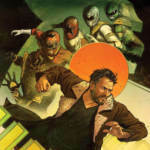 The penultimate story of Tommy Oliver and possibly his final Power Rangers story releases next month in the graphic novel Soul of the Dragon by BOOM! Studios. Following Tommy Oliver in his final Power Rangers story, he searches valiantly for his missing son, JJ, who is working with Space Patrol Delta (SPD). His past, his present, and what remains of his future will collide in this epic adventure which harkens to the classic “Old Man Logan” story from Marvel Comics. 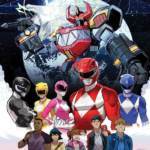 Written by Kyle Higgins – the famed Power Rangers scribe responsible for the immensely popular and successful Shattered Grid story in the Mighty Morphin Power Rangers comic – and illustrated by Giuseppe Cafaro – this is a book that any fan of Mighty Morphin Power Rangers, or the work of Kyle Higgins, do NOT want to miss. Check out a number of preview pages for the graphic novel by clicking the title of the story. Thanks to Comic Frontline for the initial release of these images. Redman The Kaiju Hunter has been received as one of the best tokusatsu to comic adaptations out there. As you could probably tell from our very own review of it back in September, we 100% love it. It’s an enthralling read with gorgeous art that doesn’t get bogged down by dialogue to tell it’s story. Now, ahead of it’s November 30th release date, Phase 6 Publishing has revealed series creator & artist Matthew Frank’s cover for the hotly anticipated Redman Volume 2! Determined not to give away what will definitely be an epic story, this cover features Redman surround by another horde of Kaiju. Kaiju that will most certainly join the next Red Fight. Redman Volume 2 arrives November 30th at Tokyo Comic-Con with it’s general sale in bookstores Mid-December. It’s English language release will come after this. We’ll keep you up to date as we know more.